Spectacular 4 bedroom, 3-1/2 bathroom private home with detached 1 bedroom, 1 bathroom guesthouse comprise this amazing property in private and desirable Portola Valley. Located on a quiet cul-de-sac, this park-like, sunny and flat 1-acre parcel with amazingly constructed buildings exudes quality craftsmanship and painstaking detail and features a spacious floor plan. This is an incredibly comfortable, entertaining environment where you will want to bring your friends and family every day. The backyard of the property boasts oak trees, resort-style swimming pool and spa, a modern koi pond, outdoor kitchen, modern gas fire-pit, organic vegetable garden, and professionally-designed landscaping. Walk out your door to some of the best hiking and mountain biking in the Bay Area at the Windy Hill Open Space Preserve. This striking home is the best of California living, pairing expansive interior spaces with an exterior environment you’ve experienced at five-star resorts, all while providing a level of comfort and privacy you will never want to leave. 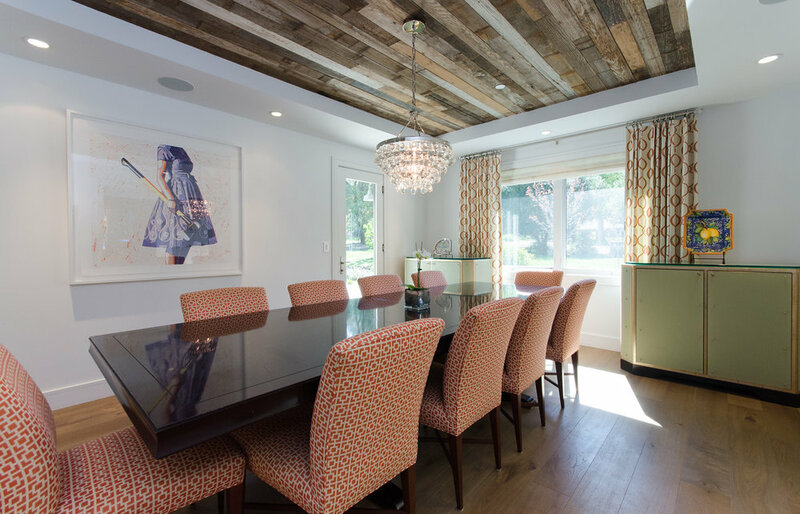 Gorgeous wide-plank European hardwood flooring flows throughout the entire interior, connecting the beautifully painted and designed rooms. 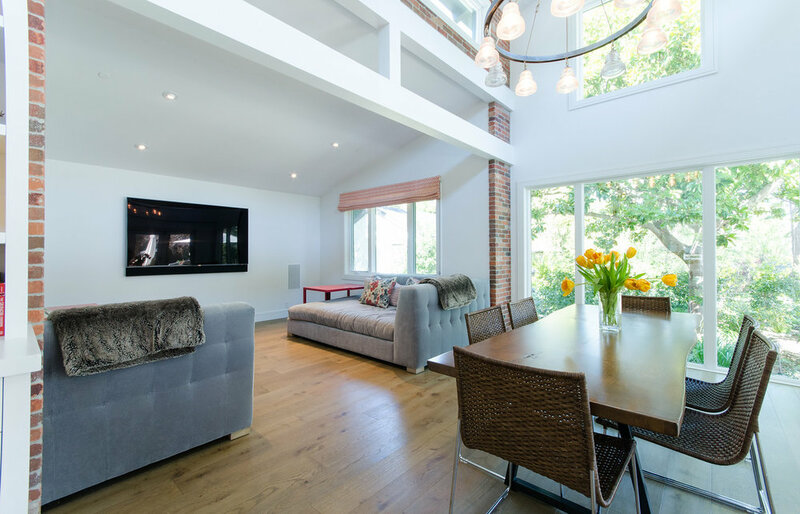 Architecturally spectacular open and high ceilings highlight the room heights and create a feeling of openness. Generous windows allow occupants to experience the visuals of the mature and manicured landscaping, oak trees, and resort-style pool area without leaving the house. The well-designed open gourmet Chef’s Kitchen and adjacent gathering areas together provide a space that you will want to utilize every day and invite your family, friends to. Open up the wall of folding glass doors to access the spacious resort-style back yard with outdoor dining, outdoor kitchen, gorgeous modern fire pit with a comfortable seating area, and the amazing pool and spa area overlooking a hillside planted with lavender, sage, and rosemary. Relax in the sun or under the umbrellas on chic loungers from Restoration Hardware with custom-made designer cushions – you will feel like you are on vacation every day. 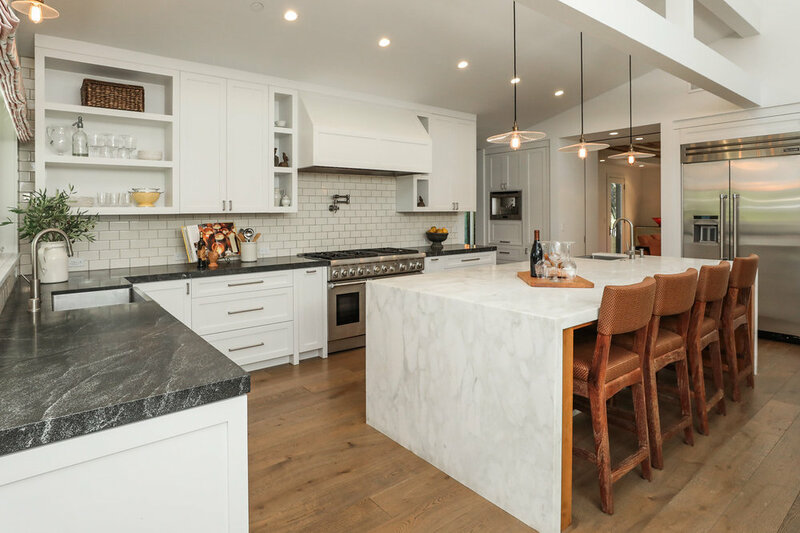 The well-appointed Chef’s Kitchen features a massive Carrera marble “waterfall edge” island and gorgeous stone countertops with plenty of room for entertaining and food preparation. Gourmet appliances, including an oversized Sub-Zero double-door refrigerator and freezer, 48” Thermador professional gas range with griddle and double oven make preparing and cooking meals a pleasure. A built-in Thermador espresso maker adds the final touch of convenience and luxury. 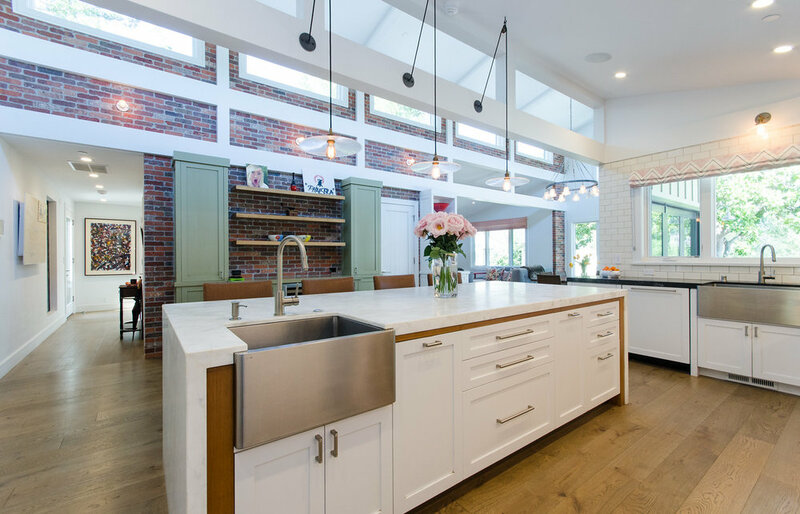 Ample windows, beautiful open and closed shelved cabinetry, and custom-made rustic-chic light fixtures round out the amazing kitchen. The expansive master suite opens to a large, beautiful master bathroom with walk-in double Rain Head shower, his and her vanity sinks, tons of storage, and large counter areas. A second bedroom suite features vaulted ceilings, huge windows, and a private bathroom with a large shower. All bedrooms are designer, private, and comfortable. All bathrooms are amazing, luxurious and showcase elegant designer tilework. A beautiful, custom covered swimming pool and spa is conveniently located in the back yard, surrounded by mature landscaping and concomitant low-water-use irrigation. Spend your days relaxing in the sun, lounging or napping on the designer daybed by the pool and/or swimming laps in the pool’s long lap-lane. In the evenings, enjoy preparing dinner al fresco on the gourmet gas grill then dining with friends at the oversized outdoor dining table, then relax under the stars around the gorgeous custom-designed concrete fire pit. An oversized two car garage is easily accessible from the street from a long driveway which has capacity for several guest cars. State-of-the-art solar panels greatly reduce energy costs and help power the Tesla electric car-charger built into the garage. 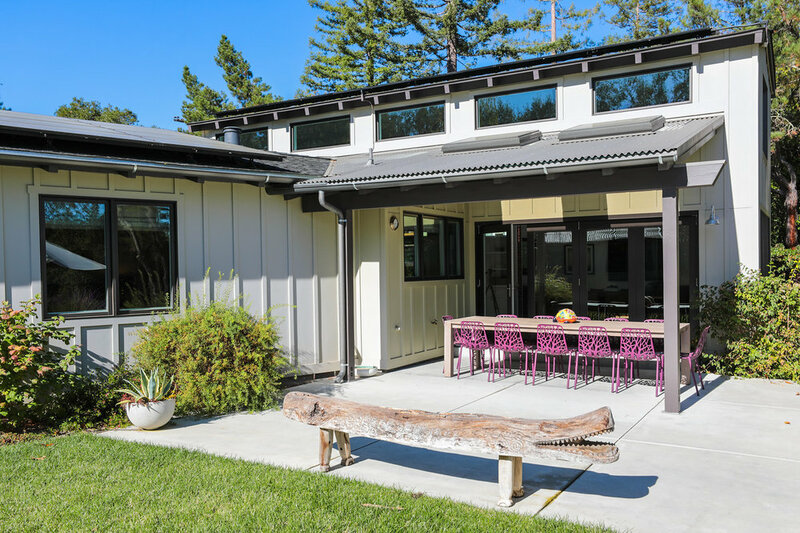 The property exteriors feature reclaimed barn wood from Utah, privacy provided by mature olive and redwood trees, as well as luxurious landscaping with custom low-water irrigation and drip systems. 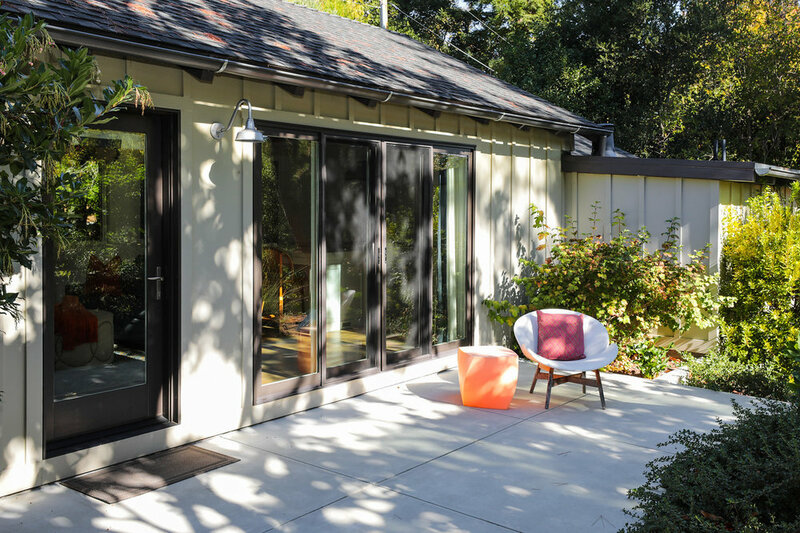 Feel like you are in the country, while being conveniently located only minutes from 280 freeway, Silicon Valley and the charming towns of Portola Valley, Woodside, and Palo Alto. 10 minutes to Stanford University, 25 Minutes to San Jose, 35 Minutes to San Francisco.